CTS-8800Plus is upgraded on the new generation platform, empowered with 15-inch medical LCD ,optional built-in lithium battery, enhanced B/W images and upgradable color Doppler package.The complete 2D, 3D, 4D, PWD make it a competent machine for OB/GYN doctors’all diagnostic requirements.Tissue Harmonic Imaging technology (THI), Speckle Reduction Technology (SRT) & Compound Imaging technologies contributes substantially to making it a higher-resolution ultrasound imaging machine. It's an ideal choice for those clients who need 3D or 4D ultrasound machine with a small budget. Speckle reduction technology: The technology assists to reduce noise and artifacts purify tissue shading and edging improve contrast resolution and identification of early tissue/structure lesion. 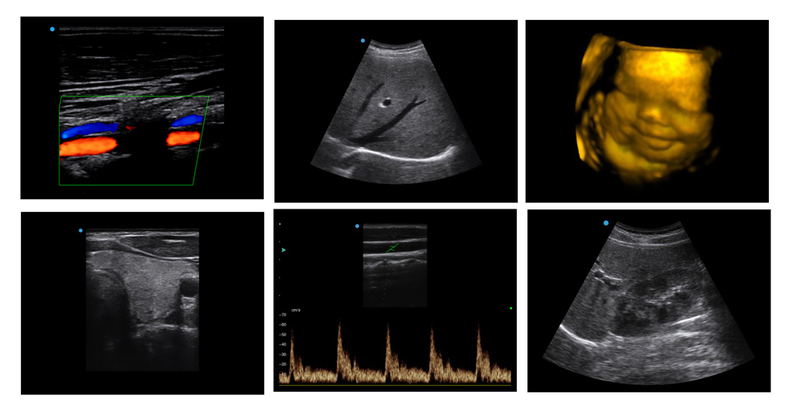 Trapezoidal imaging: The technology supports extended field of view to display more image information without sacrificing image quality or moving the probe. Smart one key optimization: The system smartly adjusts TGC and B gain in B mode as well as base line PRF and PW gain to acquire the best B/W image and PW image only by one-key press. 4D Lite: The system offers excellent 4D imaging. Volumetric imaging technology covers obstetric 4D fetus imaging and gynecological transvaginal volumetric imaging which show more accurate and specific images for different clinical demands. PW: The system supports the Pulse Wave Doppler module for vascular and cardiology quantitative analysis. Panoramic imaging: The system allows extending wider view for doctors to scan large area tissues with the movement of transducer scanning.